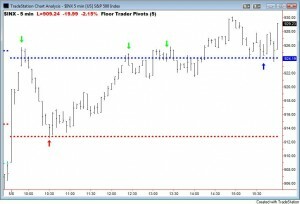 Each day, floor traders use a formula to calculate what might be the “pivot points” for the day’s trading. They plug in the high, low, and close from the previous day, and then the formula gives them seven levels to watch. With so many large traders keying off of these levels, they can become a self-fulfilling prophecy. Notice how the morning’s plunge stopped almost exactly at the red pivot line (red arrow). The area of the blue pivot line was resistance in the morning (green arrows), and then support in the afternoon (blue arrow). 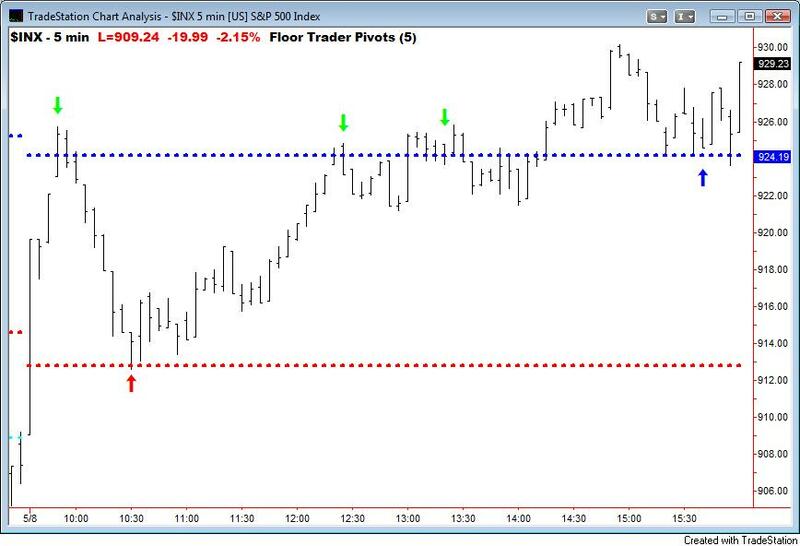 The other pivot levels aren’t shown because prices did not approach them on Friday. For those of you who don’t have software that will calculate the pivots, you can do it manually with the calculator on this page. Further reading: The General Theory of Day-Trading.